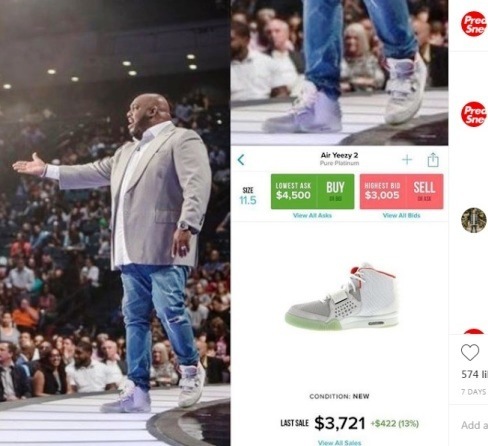 A new Instagram account has been launched calling out famous pastors for their taste in expensive shoes. Some of which cost approximately $4,000 per pair. The Instagram account @preachersnsneakers started recently and currently has exceeded 31 posts. In less than three weeks it gained over 8,000 followers, a Thursday article in Fashionista explained. It now has 68,300 followers. The account's founder, Tyler Jones, a pseudonym, explained it began as a joke but noted that the juxtaposition of pictures of pastors sporting pricey, trendy sneakers. It is position alongside the prices of those things has resonated with an audience. The photos raise questions about how the money donated to these pastors' church is being used. The account has even caused pastor Chad Veach of Zoe Church in Los Angeles to change his Instagram handle. This was after a preachersnsneakers post showed him with a backpack from Gucci that goes for $1,980 and Rhude trackpants that cost $794, Fashionista reported. "I'm not trying to cause a division; me and him both believe inherently the same things. I just think that if you are in church you should know how your pastor is spending the money." One post features pastor John Gray of Relentless Church in Greenville, South Carolina wearing Air Yeezy 2 pure platinum sneakers. It is spotted alongside a post where it is noted that a pair of them sold for $3,721. Another post features Seattle-based pastor Judah Smith wearing Gucci pants and his wife Chelsea wearing a Gucci tank top. Materials which are listed at $980 and $490, respectively. Another post shows North Carolina megachurch Pastor Steve Furtick wearing Jordan 1's, which sold for $968 in one auction. Others have told Jones he is hypocritical and was causing disunity within the church. However, but he maintains he is leaving the issue open-ended, worthy of discussion. Some may consider him as taking passive-aggressive swipes at pastors while others view it as fun pictures of preachers in trendy outfits. A Dallas-based pastor reportedly reached out to Jones asking to be featured on the page. When asked if he thought it made any difference if the designer brand gear were gifts or purchased by the pastors in question? Jones said that he did not know if they were gifts but he could not reconcile it and could not think of a good explanation why pastors would want to wear things most of their congregants could never afford to buy. "It'd be one thing if they were to come out and explain, like, 'this is why I bought this pair of Off-White Chicago 1s. Because I feel strongly about how they are made.' If you could get a congregation to somehow agree that their money going to those $2,500 pair of kicks was good for the kingdom of God then I can't have argument with that," Jones said.